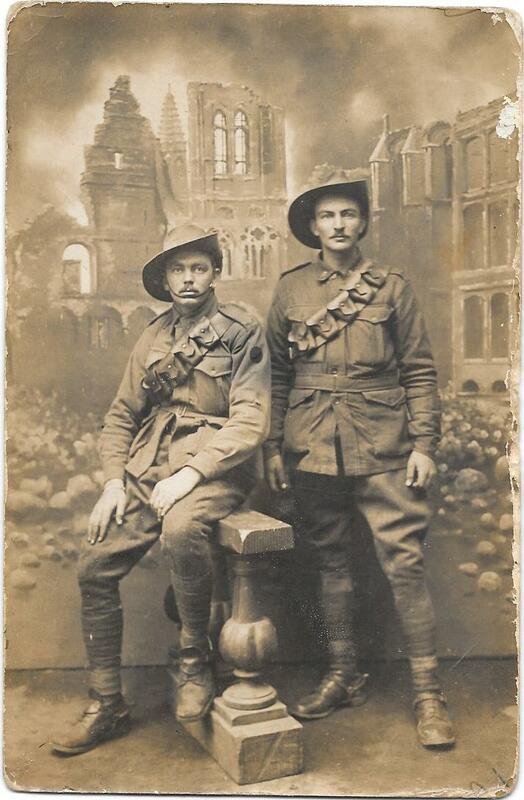 Mrs K. Edmonds has sent me this studio portrait photograph of her grandfather William Hilton Saunders with another soldier, who she thinks is his friend and fellow Coo-ee from Wongarbon, William Collyer. Driver William Hilton Saunders is seated on the left in the photograph. “You would not know Will and I now, we both have moustaches, and I weigh 70 kilogrammes, which is equivalent to about 11 stone, so you see I have put on a considerable amount of flesh already since leaving Australia”. 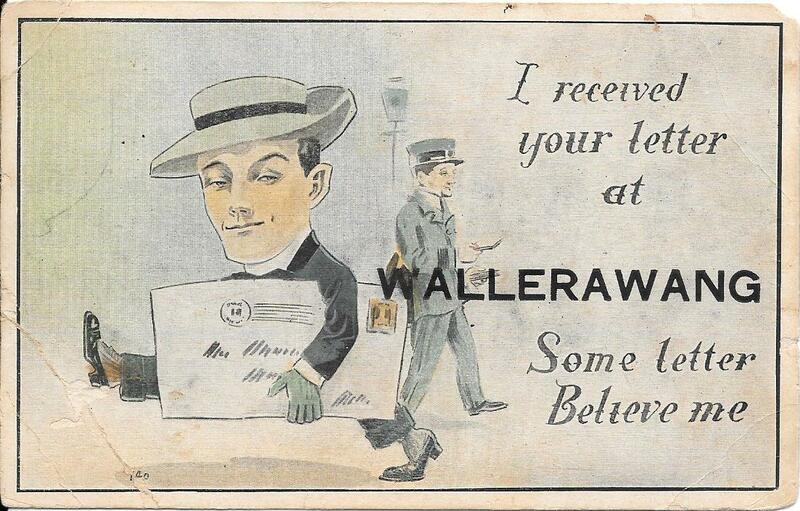 ‘’I went out with G S W [General Service Wagon] & team to Ypres (about 6 miles) for bricks. Cruel yet interesting sight to witness. A fair town in peace time, but was utterly devoid of life except for soldiers who have to live in old cellars etc. Everything is one mass of ruins & where buildings are not blown right down enormous gaping shell holes mark the billet of some of Fritz’s death messengers. We got a couple of loads of bricks from the Ypres church & arrived back early this morning, out all night”. On reading William Hilton Saunder’s 1916 to 1918 diaries, I only found one entry in which he refers to having had his photo taken during this period. On Sunday, 22nd October 1916, he wrote: “Will Collyer & I went to Poperinghe on leave. Rode our mules & had a good look around. Both had our photos taken. Poperinghe about the size of Dubbo …”. It seems likely therefore that this is the photograph of William Hilton Saunders and William Collyer that William Hilton Saunders referred to in his diary. Saunders, William Hilton, personal diary, 1916. Original diary held by UNSW Canberra, Academy Library Special Collection. Saunders, William Hilton, personal diary, 1916. William Hilton Saunders joined the Coo-ee March at Wongarbon. 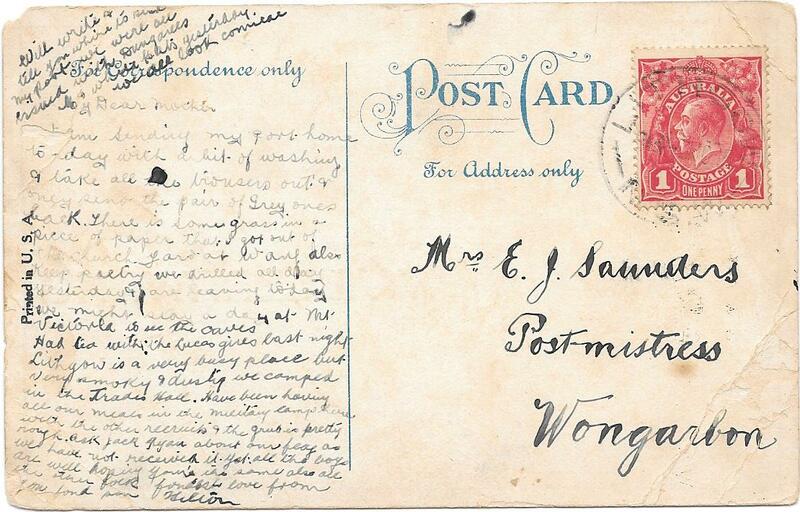 Several of the many letters he wrote home were published in local newspapers. He also kept diaries from 1915 to 1919, which are now part of the UNSW Canberra Academy Library’s manuscripts collection. Stephen and I visited the Academy Library at the Australian Defence Force Academy in Canberra on 22nd August 2013 to view W. Hilton Saunders’ war diaries. There were 5 small fragile diaries, sealed in bags, which we were able to look at under supervision, wearing white gloves. 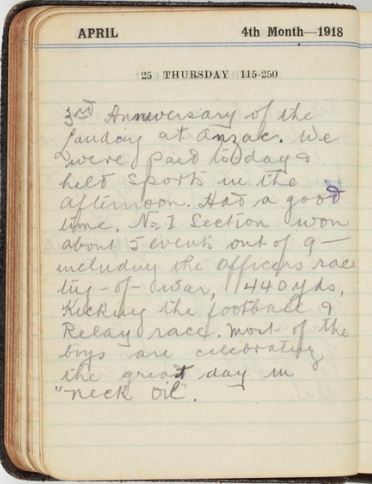 There were many diary entries of interest in these diaries that I would have liked more time to read, but the time we had available to visit was limited, and it was difficult to write many notes in pencil, wearing gloves. 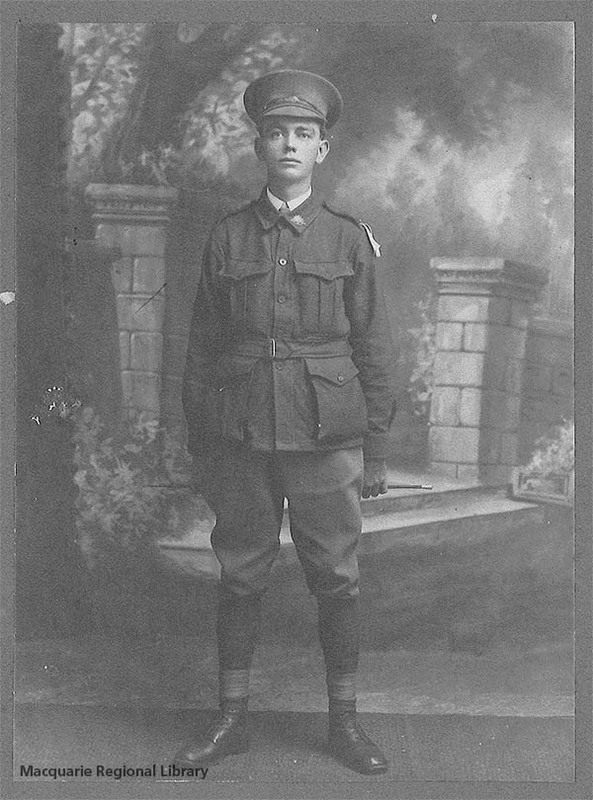 I was advised by the State Library of New South Wales last week that William Hilton Saunders’ war diaries (1916-1919) are now available online on this library’s website at http://www.acmssearch.sl.nsw.gov.au/search/itemDetailPaged.cgi?itemID=1323843. To access the digitised diaries, click on the Collection Hierarchy tab, then the title for each year’s diary, then click on ‘view images’. This online access to W. Hilton Saunders’ diaries provides a wonderful opportunity to read through the wartime diary entries of one of the Coo-ees, following his experiences in the First World War, from his training at Liverpool Camp, to his voyage from Sydney to Egypt on the HMAT A15 Star of England, his experiences in the training camp at Egypt, and then on the Western Front, and on hearing of the Armistice that ended the war. Unfortunately the 1915 diary has not been digitised, probably due to its limited number of entries, with none until the end of the year. 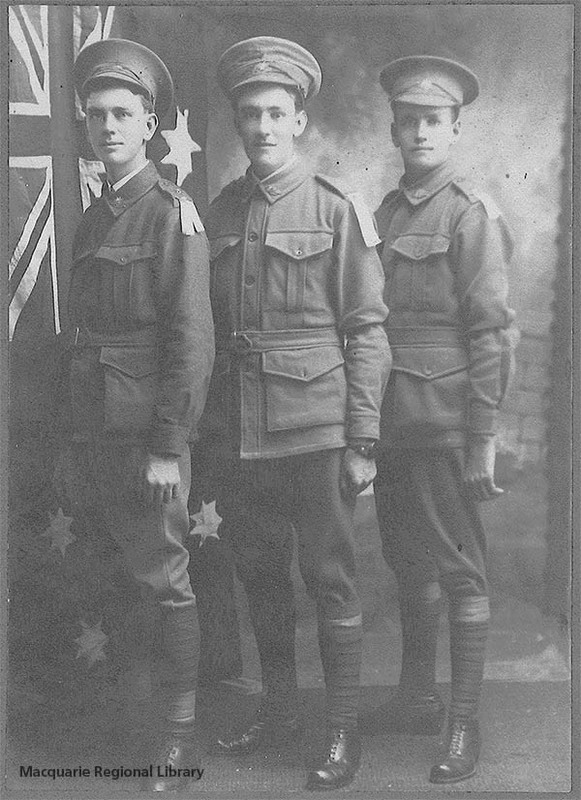 The 1915 diary had an inscription inside it from a family member dated 8th October 1915 (the day W. Hilton Saunders did his medical and original attestation at Gilgandra before the march commenced). Unfortunately he did not make any entries for the period of the march, only a mention of arriving in Liverpool camp. There were however lots of female names and addresses written in the back of this 1915 diary with addresses from many the towns and villages along the march, from Stuart Town onwards (where he re-signed his attestation form on 19th October 1915). 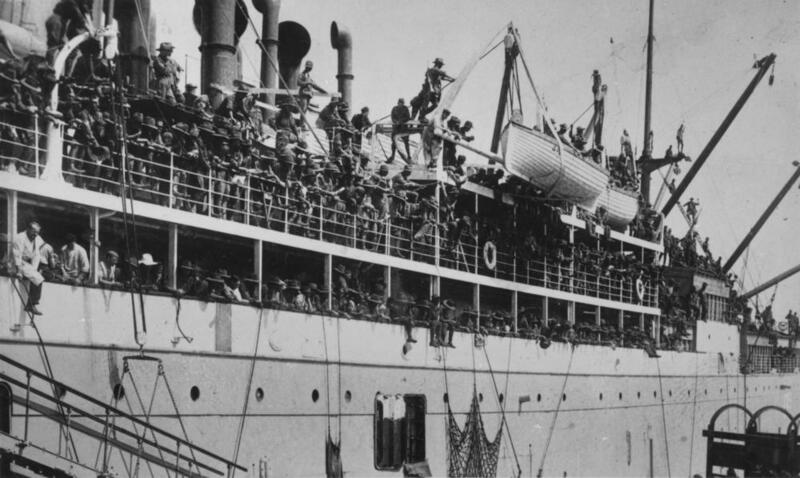 W. Hilton Saunders was one of the main contingent of Coo-ees that embarked from Sydney on HMAT A15 Star of England on 8th March 1916, which arrived in Egypt on 11th April 1916. He recorded daily entries in his diary for this period. March 1916: 8 Ash Wednesday. “Up at 3 a.m. left Show Ground for wharf 4.57 a.m. & at 8.10 a.m. moved out from wharf amidst cheers from thousands to tune Auld Lang Syne Cleared Heads 2 p.m. water rough chopping seas fore deck”. The Coo-ees when they joined the Coo-ee March and enlisted in the AIF had expected to be going as reinforcements to support the ANZAC troops on Gallipoli. That campaign finished while they were still in training in Liverpool Camp. April 1918: 25 Thursday. “3rd Anniversary of the landing at Anzac. We were paid today & held sports in the afternoon. Had a good time. No. 1 Section won about 5 events out of 9 – including the officers race … 440 yds, kicking the football & Relay race. Most of the boys are celebrating the great day in “neck oil”. [aka beer].